The cavernous venue of Neverland II felt strangely empty, meek even, lacking the usual crowds and booze soaked bravado found in a Thai disco. 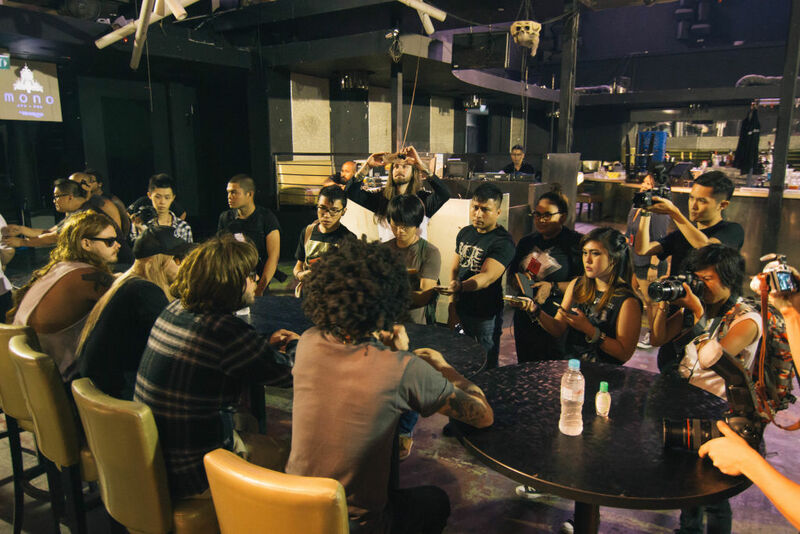 We arrived just as fans were lining up for their meet and greet with the band – clutching on to the band paraphernalia that was to be signed. Ripped skinny jeans two sizes two small, patches on those jeans, patches on those patches. More piercings and eyeliner than mother would approve of. The band had not even begun playing and I was already getting PTSD flashbacks to my own metalhead days – buying Trivium CDs and drawing pentagrams on every conceivable surface. While She Sleeps was affable – no rock star swagger or unholier-than-thou posturing. They seemingly also eschew from the typical pretty-bad-boy aesthetic with their contemporaries: the floppy black hair, copious amounts of eyeliner and (thank god) skinny black ties. But then again my last flirtations with this particular flavor of metal was when Bat Country by Avenged Sevenfold was receiving heavy rotation on MTV. So maybe it wasn’t that surprising when they turned up for the interview in decked out in shades and a variety of ironic wigs, a jeering pastiche of any hair-metal predecessors. Being on tour undoubtedly means some level of debauchery – while not on the level of chucking TVs out of hotel windows – still involved worrying lapses of memory and being “naked cowboys” on the tour bus. Moving from dark, grimy basement clubs to large festivals has made them realize that while the grass is greener on the other side, there was nothing to stop you from shuttling back and forth both sides of the grass as “the contrast between the two is the great thing because you get to do the big shows and then you can come back and do the sweaty shows” because “neither is better”. Arriving at the venue an hour before the band was to play, we were greeted by the horde of concert-goers waiting for the doors to open – it was black jeans and band tees as far as the eye could see. The air stank of haze and cigarette smoke and youthful excitement as I tried to take in the whole scene. Of course by this point the humidity and cynicism had already gone to my head as I surveyed the kids camped out in their friendship circles of darkness and despair. Sitting with their friends, probably discussing their personal anguish and latest purchases from 77th street. There were two thoughts in my head then: 1. Half of these kids were probably too young to be smoking, and 2.Why were there so many KISS patches? Surely no one younger than 40 thought KISS was cool. One gets a sense of apprehension before every metal gig – that tense moment of expectations before the band starts playing. Eager anticipation of an adrenaline rush and that fever pitch where you eventually enjoy repeatedly smashing your body into others’ at a high velocity. There was a period of relative quiet before the band exploded into their first song – and suddenly I’m 15 again. These guys are tight – the entire set progresses with nothing more than small smiles and nods to each other. Like any performer worth their salt, the band is blessed with an approachable yet monstrous stage presence cultivated through endless touring and a predisposition for charisma. Frontman Loz is a force unto himself, all spitting and screaming and snarling as he deftly worked the crowd with a rare, menacing energy and intensity usually reserved for the darker and heavier subgenres of metal. Soon I found myself enviously eyeing the very active mosh pit- was I too old to enjoy getting bruised and battered? To once again drink from that communal well of sweat and shoves, to relish my face getting mashed into a moist armpit. I was not. Instead I stood teetering at the edge between the arm-folders and the moshers, trying to get as close to the action as possible without losing my cool. 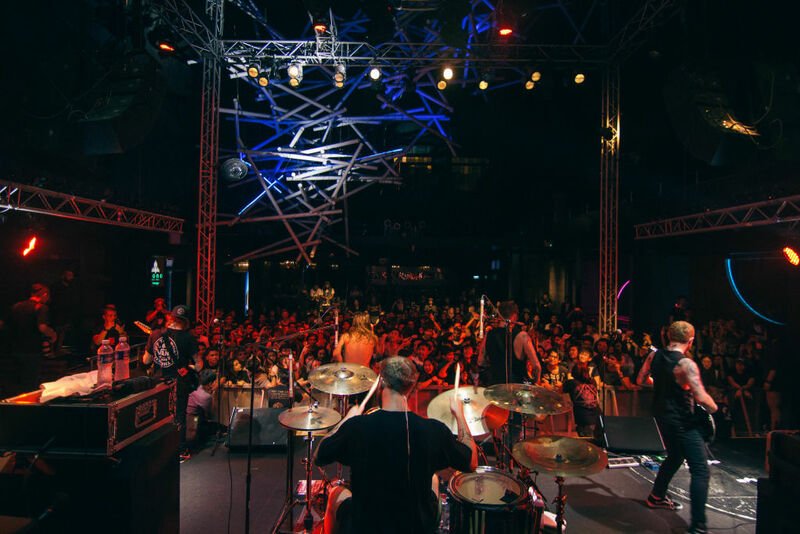 It was a decision I believe I will live to regret – when all too soon my bones ache and my step falters, when entering any mosh pit will mean experiencing certain death.